Registration is now open for this year's AAUP/AAUP-CBC Summer Institute at Roosevelt University in Chicago. From July 25 to July 28, more than two hundred higher education professionals from around the country will gather for four days of exciting workshops and special programs. Highlights include a plenary session on the state of academic freedom, peer-to-peer information-sharing sessions, AAUP essentials, Friday night reception, and an awards and recognition luncheon. The conference also includes business meetings of the AAUP and the AAUP-CBC. The current issue addresses questions of speech that have fueled the campus culture wars in recent years. Articles discuss the assault on the public mission of higher education; the implications of a polarized political climate for faculty, administrators, and students; and debates about academic freedom, free speech, and inclusion. While online teaching tools can enrich education, contracts with for-profit online education corporations can present problems for academic freedom and shared governance. Check out our resources and learn how you can get involved in making sure that higher education serves the common good, not private profit. 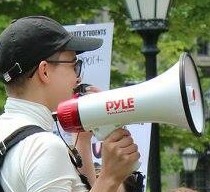 Unnecessary “campus free-speech” legislation threatens to chill dissent on campuses in an increasing number of states. Learn more about this issue and what you can do about it. 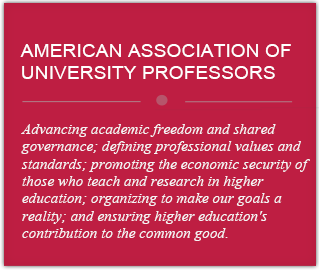 The AAUP's One Faculty, One Resistance campaign brings together faculty, academic professionals, and supporters to fight for higher education. The campaign website serves as a hub for our work on fighting harassment of faculty members, protecting academic freedom, and uniting the faculty. The AAUP released a governance investigation report about the Maricopa Community Colleges district governing board’s decisions to repeal the entire faculty manual, put restrictions on the faculty’s participation in institutional decision making, and terminate a “meet-and-confer” process. Investigators found evidence which strongly suggests that the board’s intervention was an engineered performance of political theater motivated by partisan ideology. A strike has been averted at New Jersey’s largest public university after Rutgers AAUP-AFT faculty union, which had been working without a contract for nearly a year. The proposed four-year contract includes pay hikes for faculty members, pay equity measures for female and minority instructors, and better job security for some non-tenured professors. If the Rutgers University faculty union AAUP-AFT decides to call a strike after marathon bargaining sessions with the university for a new contract, union members are ready: Official picket signs have been printed, picket line captains trained, and students prepared to provide support. Our annual faculty-compensation survey provides a snapshot of the earning power of full-time and part-time faculty members. The long and short of it: Pay raises were modest, faculty buying power has eroded, and many different factors are rolled into faculty pay. But the data, from nearly 1,000 two- and four-year colleges, also tell us three things about the academic workplace. A new "free speech" law in Iowa will require public universities and community colleges to uphold the "fullest degree of intellectual freedom and free expression." Katherine Tachau, Iowa AAUP president, said freedom of expression is at the heart of universities. It's not clear how the law will change their campus, but her organization worries about "undesirable unintended consequences." Rutgers AAUP-AFT, the bargaining unit representing full-time faculty and graduate employees at Rutgers University has its members’ blessing to call a strike if contract negotiations aren’t successful. Eighty-eight percent of its members voted to authorize union leaders to call a strike. Many organizations, including the AAUP, are opposing President Trump's plan to issue an executive order to cut off federal research dollars to institutions determined not to be supporting free speech. A meeting of the AAUP's Committee A on Academic Freedom and Tenure. The AAUP’s Annual Conference on the State of Higher Education includes the annual business meetings of the AAUP and the AAUP Collective Bargaining Congress. The 2019 AAUP/AAUP-CBC Summer Institute is coming to Chicago! The Nominating Committee of the AAUP’s Assembly of State Conferences (ASC) has submitted a final report about nominations for the following positions on the ASC Executive Committee: Treasurer and two At-Large Members. Did you know that the AAUP has an online career center to help colleges and universities connect with qualified applicants? See open positions and learn how to apply.